Stretching the iliotibial band (IT band) is something that people rarely think of unless they are involved in sports of some sort. Because it is not a muscle, it doesn't occur to people that it would need to be stretched. The IT band provides attachment for the gluteus maximus and tensor fascia lata for hip abduction and provides stability to the knee. In the closed kinetic chain the action on the IT band controls the movement of the leg toward midline (adduction) and lateral tilting of the pelvis. This stability is needed in running and walking. How does the IT band move? How is IT band syndrome and trochanteric bursitis treated. How can I prevent IT band problems? The IT band is a thick band of fascia that lies over the outside of the thigh. The deep fascia of the thigh is known as the fascia lata. It is strong and dense and invests the muscles of the thigh like a stocking. it is thickened along a band from the iliac crest to the tibia and it is this part that is referred to as the iliotibial band. The muscles tensor fascia lata and gluteus maximus insert into the IT band and the IT band is continuous with the lateral intermuscular septum deep to it. How does the iliotibial band move? The iliotibial band moves forward and backward relative to the axis of rotation of the knee and is thus prone to friction over the lateral epicondyle on the outer aspect of the knee. There is a bursa that lies between the ITB and the epicondyle which often becomes inflamed in these friction syndromes. The iliotibial band also moves over the greater trochanter of the femur as one walks or runs. That is what you feel is the "hip bone" on the side of your pelvis. It is here that it is also prone to friction. The large trochanteric bursa is a cushion that lies between the iliotibial band and the greater trochanter. This becomes inflamed when the iliotibial band is tight. This is sometimes referred to as "snapping hip syndrome" or "iliotibial band syndrome". Pain and tenderness are apparent over the hip or the outside of the knee or both. A snapping may be felt during walking or stair climbing. Tightness in the IT band is usually the cause, but in some athletes it may be due to tightness in the hip muscles, pulling the IT band tight. Excessive use of the hip abductors and external rotators can result in muscle imbalances causing ITB tightness. Lengthening the ITB and correcting poor movement patterns and muscle imbalances is the best method of treating ITB tightness issues. To prevent these issues it is important to incorporate a stretching routine into your training program that addresses hip musculature and ITB. A bursa is a sack of fluid found between moving parts of the body. There is a large bursa over the lateral aspect of your hip that is normally asymptomatic and functions to allow the iliotibial band to glide smoothly over the greater trochanter. Through acute trauma, cumulative trauma, or repeated irritation from friction, the bursa can become inflamed. Often stretching is included in treatment to address the causes of trochanteric bursitis If you suspect you are suffering from pain related to trochanteric bursitis it is important to see your physical therapist for a full evaluation. Simply stretching may not be enough and the sooner you address problems, often the easier they are to fix. IT band syndrome is one of the most common problems amongst runners. Repetitive knee flexion will create excessive friction of the iliotibial band on the femur which can be exacerbated by running on the same side of the road or always running the same direction around the track. Over pronation of the foot while walking or running. This overpronation causes excessive rotation of the tibia, which in turn causes excessive rotation of the femur. Leg length discrepancy. A leg length discrepancy causes a tilting of the pelvis forcing the IT band to stretch over the prominences of the higher hip. 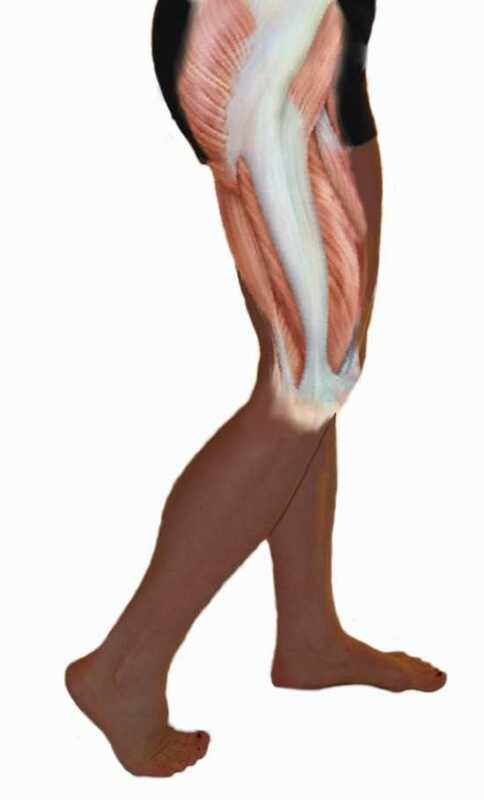 Muscle tightness in the gluteal muscles will pull the ITB tight. Treatment of iliotibial band syndrome and trochanteric bursitis. Inflammation Ice, antiinflammatories, and ultrasound may be used by your physical therapist. Relative rest is also advised until inflammation is under control. Persistent inflammation results in the deposition of scar tissue, worsening the friction and tightness. ITB tightness ITB stretches at home and those assisted by your physical therapist. See the list on this page. Muscle imbalances Overuse of some muscles, and tightening of others can result from specific sports training or just a sedentary lifestyle and must be addressed to prevent recurrences. Gait disorders can be corrected through the use of orthotics, or if there is any other underlying joint dysfunction, this will be addressed through manual treatment by your physical therapist. Poor movement patterns can cause excessive pelvic motion resulting in stress on the ITB. Gait training and feedback can assist you in correcting this if this is an issue. How can I prevent iliotibial band problems? If you are a runner make sure you are fitted with the appropriate shoes or wear your othotics if those have been prescribed. Replace your shoes in a timely fashion. The standard is every 300-500 miles, but depending on your wear pattern that may be different for you. Avoid running too many hills or stairs. If running on the street, switch sides of the street regularly. If running on a track, change directions regularly. use your foam roller on a regular basis. When running, don't increase your mileage too quickly. Above all, if it hurts don't run through it. Have it evaluated by a physical therapist. To stretch your right iliotibial band lean your right hip against an exercise ball. Cross the left leg in front of the right. Allow the right leg to move out away from the exercise ball while keeping your chest up. Lean further into the ball as you left your chest up and pull your head to the ceiling. 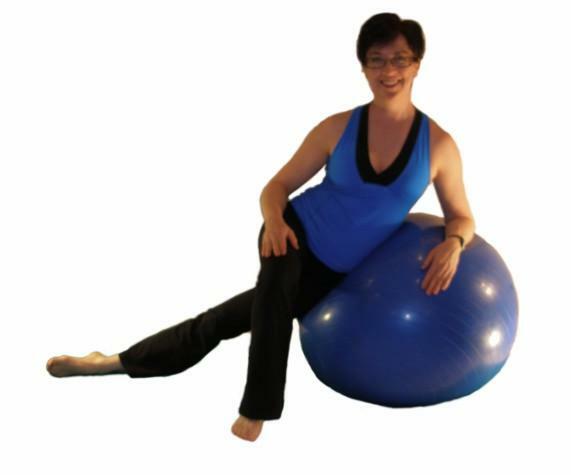 Breath out as you gently rock the pelvis back and forth and sink into the exercise ball. To stretch the right IT band in standing, stand with your right side facing a wall or leaning on the back of a chair. Put your right foot behind your left foot and point the toes of your right foot out about 45 degrees. Put your left hand on your left hip and while keeping your right leg straight, push your hip in toward the wall. 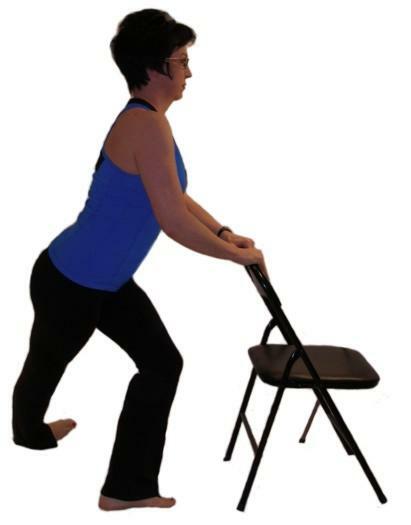 Another method of stretching the ITB in standing is to stand facing a chair or counter top. Put your right foot behind you and to the left of your left foot as far as you can while remaining tall. Without bending forward, lower yourself until you feel tension in the outside of your right thigh. Relax and exhale, holding this stretch for the appropriate time. To stretch the right it band lie on your left side with your left hip and knee flexed to 90 degrees. Put your right hand on your right hip to stabilize your pelvis. Bend your right knee to 90 degrees as your right hip stays straight. Allow gravity to pull your right knee toward the floor. Be sure to keep your pelvis stable with your right hand. To do this stretch you must be able to comfortably sit on the floor and already have good hip mobility. Sit with your legs crossed, right leg on top . Hold this position for the appropriate time, relax and breath. Using the foam roller helps to release adhesions, relax the muscles, stimulate the circulation and gently stretch the ITB and surrounding musculature. Lie on the right side with the foam roller beneath the thigh toward the top of your thigh. Place your left foot in front of you for balance and support. Roll yourself slowly along the foam roller toward the knee but don't go beyond the knee. Be sure to move slowly and breath throughout. Do not apply so much pressure that it is painful, and if you get to a tense area you can hold it for 20 to 30 seconds extra at those points. Using the stick to loosen up the fascia on the lateral aspect of the thigh is most easily done by a partner. Lie on your left side with left hip and knee slightly bent. Grab hold of your right ankle behind you with your right hand. Allow gravity to pull your knee down toward the floor. Have your partner use the stick up and down on your vastus lateralis and iliotibial band for 20 to 30 strokes as tolerated. If you suffer from iliotibial band syndrome it may be because of underlying weaknesses in your core and/or hip musculature. Stretches are necessary, but you should also be evaluated by a physical therapist to determine if there is an underlying imbalance. A study published in the Clinical Journal of Sports Medicine looked at 24 randomly selected long distance runners with IT band syndrome compared to 30 asymptomatic long distance runners. (1) It was found that those with ITBS had statistically significantly weaker hip abductor strength on the affected side when compared to the unaffected side and those of the uninjured runners. They also found that after a 6 week program of strengthening 22 of the 24 athletes were painfree and there was no report of recurrences 6 months later. A prospective study of the biomechanical forces on the IT band in individuals with iliotibial band syndrome found that those suffering from the disorder exhibited abnormal hip and knee motion. (2) Excessive hip adduction and knee internal rotation during running and bicycling causes compression of the IT band against the lateral femoral condyle of the knee. This group of researchers also recommend treatment that includes controlling these movements through stretching, strengthening, and reeducation. 2. B Noehrena, I Davisa, J Hamill. Prospective study of the biomechanical factors associated with iliotibial band syndrome. Clinical Biomechanics Volume 22, Issue 9, November 2007, Pages 951-956 .